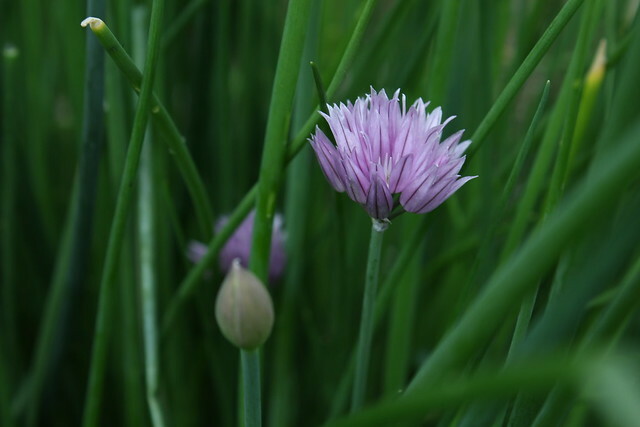 I love that the rain has made all the flowers bloom spectacularly, especially the purple pompom flowers of chives - they look so good against the green leaves and the bees adore them. Such is my admiration for this noble herb that I planted a clump in my 'drought' border (the hose doesn't reach there) among perennials, grasses and alpines - to be looked at, not eaten. The other clump sits, appropriately, in my herb bed where it's currently flowering prolifically. Every plant (not just chives) is genetically predisposed to perpetuate itself which is why it wants to flower and thus set seed. To thwart my chive into flowering for longer, I deadhead as soon as the flowers start to fade so that new flowers are coming up all through the summer to delight my bee visitors. The petals of the flowers can be eaten and taste, rather obviously, like sweet onions. Just pick the individual bulbils off the head and scatter over a salad - with other edible petals, if that's your thing. For a simple lunch, I like to chop the leaves into an omelette (add cheese as well if you like) and scatter the petals over the top as a garnish - delicious, quick and more sustaining than a packet of cheese and onion crisps! I haven't tried it yet as I've been on a juice diet to boost my energy levels for the last eight days but am excitedly anticipating making this dressing tomorrow evening for my first salad in a week! Put all ingredients in a blender and whizz to an even texture. Season with salt and pepper. Pop into a nice jug and use. Simples. Why grow chives? Apart from being a very useful kitchen herb, chives stimulate the appetite and, by extension, digestive juices. Useful for anyone feeling under the weather and less like eating. Also, chives have antioxidant properties (great for zapping those free radicals) and the leaves are mildly antiseptic. On a final note, because chives are hardy perennials they die down in winter so here's a couple of ways to have some for the colder months. Herb butter - mix 4 tbsp of snipped chives into 100g unsalted butter. Beat well to mix, add 1 tsp lemon juice. Freeze and use within 3 months. Delicious on a jacket potato. Ice cubes - but not with water! This is something I would never have thought of but read about in 'Jekka's Herb Cookbook'. Cut chives late morning, nice green leaves only, wash and dry on kitchen paper. Snip the leaves into individual sections of the ice-cube tray; once full, put the tray into the freezer - do not add water! Freeze for 48 hours. When that time's up, transfer to freezer bags. Get the bags ready as the cubes will defrost rapidly, take the tray from the freezer and immediately pop the chive cubes into the freezer bag and return to the freezer straight away. These portion sizes are ideal for a winter omelette. Personally, I'm loving the idea of chive ice-cubes - hope this post has been useful to a few folk! Not much, but at least there were flowers! 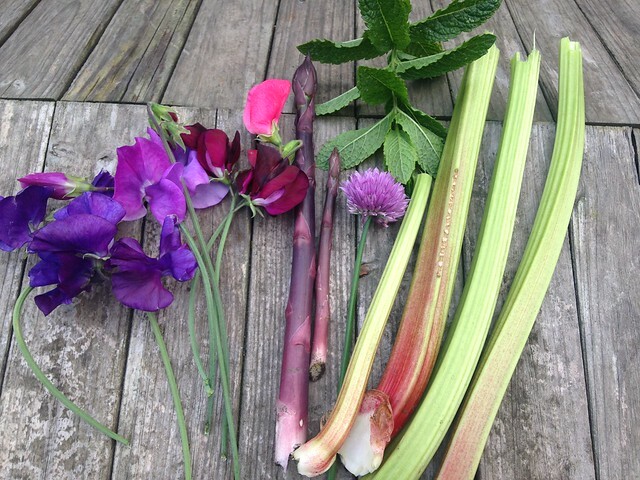 Supper of mint tabbouleh, steamed asparagus, salad + chive flowers, yoghurt and rhubarb compote. I've been struck by the 'hungry gap'. I had this covered last year with plenty of kale, broccoli and chard to pick but this year I have failed abysmally. Blame has to lie somewhere so, yes, I am going to point my finger at the weather. The mild winter encouraged my broccoli and kale to bolt in January, leaving me with nothing. 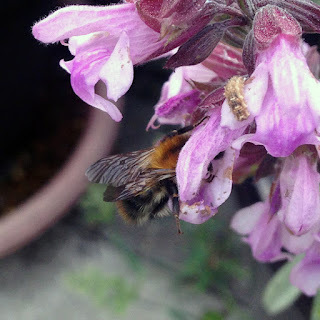 Still, the bees enjoyed the early nectar-fest from the yellow flowers. The plants have now all been ripped out and composted leaving beds ready for the next crop. 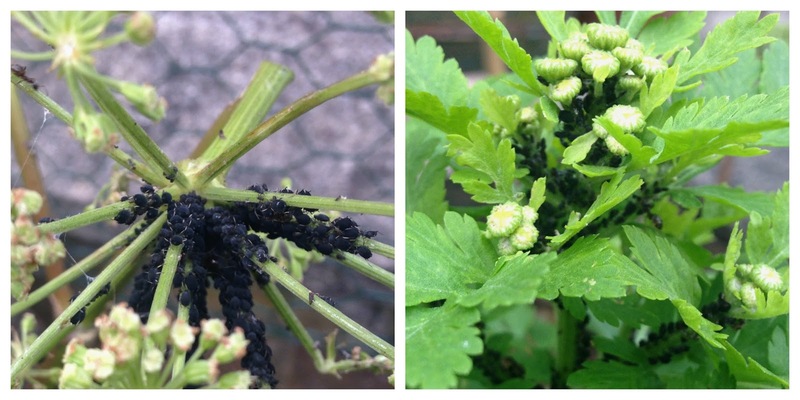 I've been checking on them regularly, not for pods but for the dreaded black aphids. And this is where (finally) it gets interesting. I have squished a tiny amount of aphids on a couple of the plants but (dare I put this in writing?) they're otherwise aphid free. (For now.) This is excellent news as I haven't yet pinched off the top leaves of my plants which are insanely delicious steamed and served with a knob of melting butter and a grind of pepper. The meal appeal dwindles if you have to wash a large colony of black insects off first. Bizarrely, just across the path in my herb bed, less than a metre distant, the angelica is clogged with black aphids as is a nearby feverfew plant. Has anyone else experienced this selective colonisation or are your beans under attack? Or is this one of the benefits of planting earlier? If that's true, then early sowing is an experiment worth repeating. Disgusting, right? I'll spare you the extra large view of these photos. 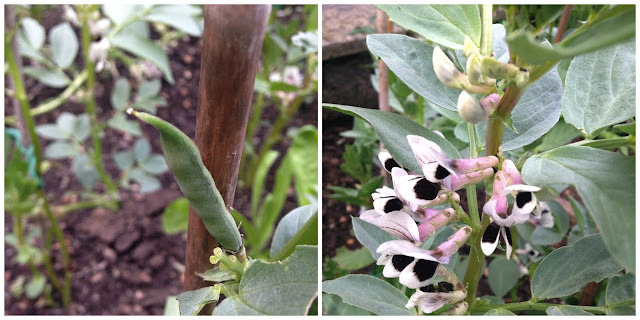 One difference that I've noticed is that my beans are radically shorter than in previous years when I've sown direct into the ground in mid-to-late April. Karmazyn bean plants last year were a good metre plus tall by the time they podded, even after having their top growth removed. This year, the plants are about 60cm (24 inches). I've sown another few rows of beans as I was sent some Red Epicure beans by Marshalls to trial plus I had some crimson flowered beans leftover in my seed box. Let's see what will happen with those ... I'm guessing I won't be so lucky next time. Oh, hey - the sun has come out since I've been typing! Looks like it's going to be a fine day (at last!) so I'm nipping off to the garden to make the most of it. Happy gardening Sunday! 10 years ago, I thought city living on the third floor meant no gardening. Managing the community space for food growing prompted a gardening journey learning to grow chillies, salads and herbs on my tiny balcony, fruit and veg in containers, crops and flowers in the 10 x 30ft Urban Veg Patch community garden. On this blog I write about what I've grown in those spaces, lessons learned and mistakes made. You'll also find reviews of the latest books and products here. © Caro Shrives (unless credited otherwise). Text and photos remain my property but can be borrowed if you ask first and link back to my blog.